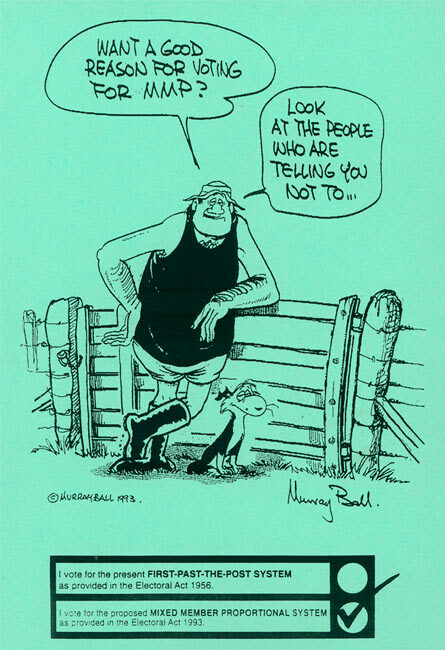 This 1993 pro-MMP poster from the Electoral Reform Coalition features a cartoon by well-known cartoonist Murray Ball. The Electoral Reform Coalition, the main lobby group for the MMP (mixed-member proportional) electoral system, was a group of citizen volunteers. It operated on a low budget, spending $181,000 on its entire campaign in 1993. This contrasted with the much-better funded anti-MMP Campaign for Better Government. This poster plays on the public perception that the opponents of MMP were the same business interests and politicians who had been running the country for years while taking little notice of public concerns. Permission of the Library, University of Auckland, must be obtained before any re-use of this image.